I'm genuinely curious, how many vapes do you guys own right now? Nearing 50, time to start a review site. 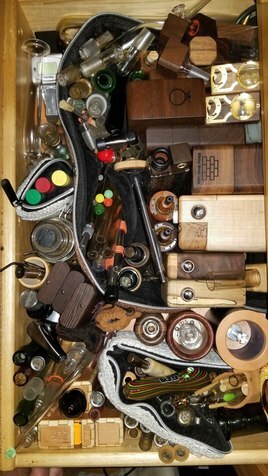 I have a bunch but if I started all over I'd have less, probably just vapcap, plenty, and boundless. Heheheh we got our next reviewers right here! Haha too late. Did reviews back in the day as well but I could never live up to VC standards so I moved on! 2. Arizer Extreme Q – occasional use. It surprises me that it works well. 3. FireFly 2 – still good for me. Thought it would be retired when I got the Ghost but I still like to use it. 4. Ghost MV1 – main vape now. 5. Airvape X – recent addition. I am a convection/ on demand person but Airvape X does work well while out and about. Still prefer the FF2 and MV1 for taste and strength of hits, but it is hard to beat the convenience of a session vape out in public. My 1st appointment with dispensary is in 2 days. So far I have invested in an Air 2 (w/ SP Bubble Straw) and a dynavap M. I plan on a ultra portable like a Pax, Airvape X, Fury 2 or even a Starry depending on how much my dispensary depletes my BUDget. how do you like the Argo? Is it better than Bud's Spelling on this link ? I own 3 right now. I still have not found the "one", but to be fair the last 2 on the list have had some issues. The companies are trying to address the issues and it is possible that once they do, one of them will be the one. I also need to get a good desktop unit. Started with a cheap canister pen by IVXX. It gets the job done, but isn't anything special. Picked up the G-Pen Elite, which I strongly disliked. Sold. Next was the OG Sticky Brick; still love it. Zephyr Ion off of Bud's clearance sale. It's pretty cool, but I don't think bag vapes are for me. Likely will be selling or gifting to a buddy. Most recently picked up the Mighty after countless recommendations. It really is pretty amazing, and I'm extremely happy with the dosing capsules for my usage. I've only got 3. My xvape fog for sesh use. Milaana for super tasty on demand and the trusty vapcap M for on demand super tasty ultra portable no battery use and is obviously great through my honey bubbler. Think that’s all the dry herb I have which I assume is what you meant. If counting oil/wax vapes then crap I probably have a good 15-20 more of those. All I really need for now...I’m waiting to see what Bud’s vape looks like! Same here. Binging on the vapegod. I just smoke spliffs and blunts with my homeboys. But I do vape oils. Does that count? Should Commentators In These Forums Comment On Vaporizers and Act As If They Own Them And Don't? Best options for portable Convection vaporizers that are NOT FF2? Vaporizers Arizer and Vapir herbs are assembled in China?